It is essential for underground development to understand the failure process of rock, which is subjected to tri-axial compression.This system has a tri-axial vessel loading high pressure, temperature and high compression force, which is controlled by servo actuator. 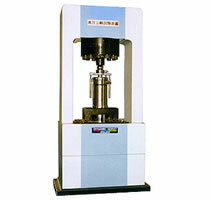 This system applies a tri-axial rock permeability test. 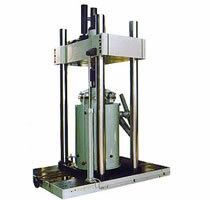 It measures the deformation of rock in three axes under the conditions of high temperature (up to 1200°C), high pressure (200MPa) and hot water,which are similar to deep underground. An inert gas is used as a pressure medium. 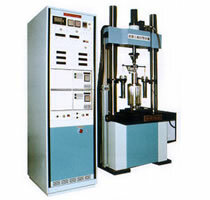 This system is used for studies to analyze the soil mechanics on the process of freezing and melting. 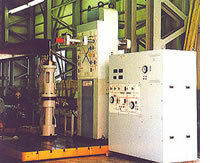 This type is adapted to a wide range of tri-axial test ranged from soft rock to sediment. The condition of tri-axial vessel is controlled by two servo actuators, which give the test piece dynamical loading.